The Tokyo Mosque built in 1938 was the oldest mosque in Tokyo, but it was demolished in February 1986, and hopes of its reconstruction nearly faded. Japan Islamic Trust (JIT) worked on an alternate Central Mosque Project 1995-1998. It collected funds. However, when work started on the construction of the Tokyo Mosque in 1998, JIT donated total funds collected, about 35 million yen (approximately US$350,000) to the Tokyo Mosque account. 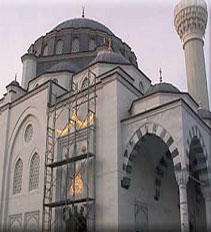 Finally, the mosque was rebuilt and opened in June 2000. 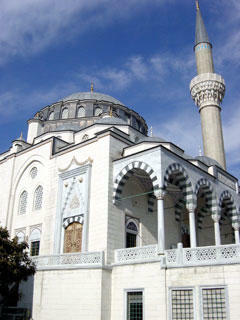 In the mosque, the Jumu`ah Prayer and the daily Prayer are held. You can see it from Odakyu-Line, between YoyogiUehara-St and HigashiKitazawa-St.
posted by xabier @ 1:08 p. m.